*Unintentional injuries are unplanned events that occur in a short period of time – seconds or minutes- in which the harmful outcome was not sought and was the result of physical energy in the environment or normal body functions being blocked by external means, e.g., drowning. http://www.maine.gov/dhhs/mecdc/population-health/inj/unintentional.html – accessed June 22, 2017. Source: CICH graphic created using data adapted from Statistics Canada, Canadian Vital Statistics, Death Database. Retrieved from Injury Data Dashboard, The Canadian Atlas of Child & Youth Injury Prevention, 2016. http://injuryevidence.ca/ -accessed June 22, 2017. 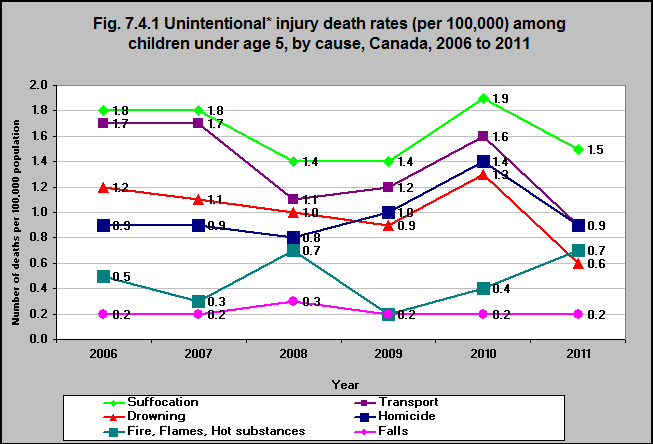 When looking at unintentional injury death rates for all children under 5, suffocation was the leading cause of death between 2006 and 2011, with 1.8 and 1.5 deaths per 100,000 population respectively. The unintentional injury death rates due to transport incidents (the second leading cause of deaths) and drowning also decreased between 2006 and 2011.